Sun Valley Bands: New Uniforms Debut! 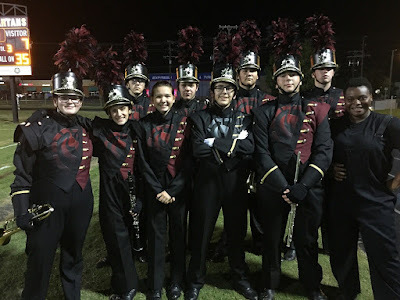 Drum Major Branden Rucci (center) with hornline and percussion captains in their new uniforms at the SV v. Olynmpic football game on September 15, 2017. September 15th, 2017 marked the debut of the Spartan Sound's new marching band uniform. The new design incorporates a maroon Spartan head onto a black and maroon jacket. 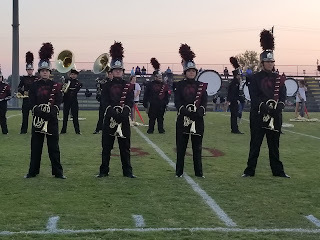 The new plumes are a little larger as well and are also black and maroon. This new design is a stark difference to the previous maroon and white design that had a gold "S" along the front. Several years of planning and fundraising made this possible. The new uniforms are also more lightweight and machine washable.